A good steak is still the classic American meal. Enlightened 21st Century diners want theirs low in cholesterol, free of chemicals and grass fed, and they're willing to pay a little more for such a cut. Restaurants have made an art out of cutting the beef, cooking it, and seasoning it. Many restaurant critics disdain chains, often refusing to review them. But with Lexington steak houses, that raises a problem. Some of our local restaurants are the originals, which because of their long success, have opened additional franchises elsewhere. So they are indeed chains, but they started here, and we feel justified in reviewing them. 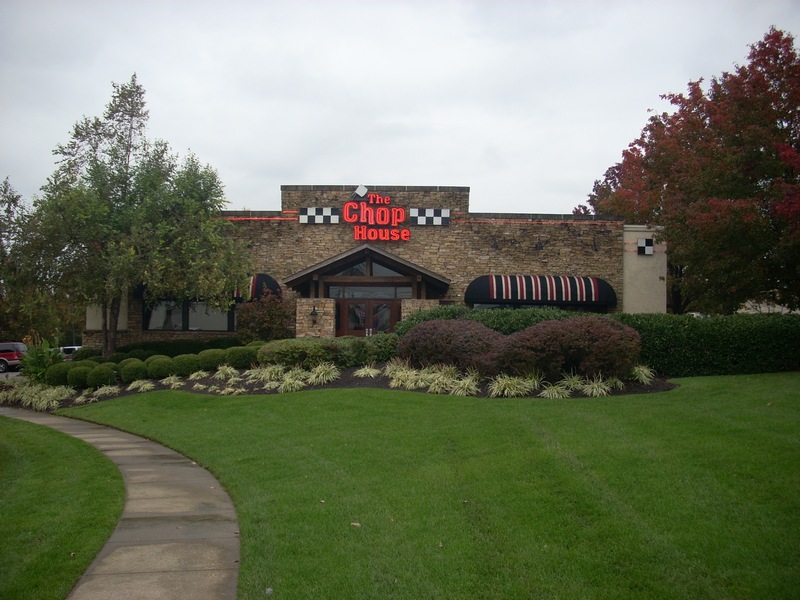 Other chains here are among the best steakhouses in town, so to exclude them would be to fail our readers, who want to know where the best are. We have excluded the lower priced, mass market chains which use inexpensive, often imported, cuts. They buy either feedlot fattened beef, pumped up with corn or steroids, confined to reduce their exercise and hasten their weight gain; or they buy imports from South America, usually Chile or Argentina, which do not have the inspection standards as U.S. beef. The restaurants we review here buy their beef from Chicago butchers. That beef usually comes from Texas, West Kansas, East Colorado, Wyoming or Montana. Columbia's has been a Lexington landmark for 60 years. They, too, have opened additional outlets, but the North Limestone location is still their headquarters. 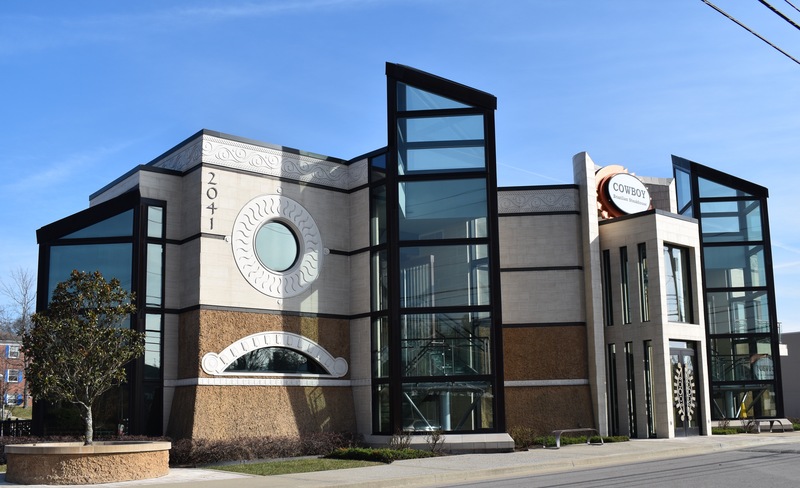 Sports figures, presidents, governors, senators, executives, artists, writers and Old Money denizens have been visiting the Limestone Columbia's since 1948. The classic is the Nighthawk Special. For $15 you get a beef tenderloin broiled in garlic butter, served with baked potato and Diego salad. The special is named for The Nighthawk, Tom Kindall, a midnight to dawn disc jockey on WVLK, voice of rock and roll in Kentucky for 40 years. Kindall is long retired, but the special named for him is in its 50th year. However, the Nighthawk isn't the only thing special on this menu. There are five other steak entrees plus steak fries. Columbia's offers the best Australian wine list in town and the soup of the day is always good. Appetizers and salads are just average, but save room for a piece of the Kentucky Silk Pie, a lingering taste of the Old South. Cowboy's is a Texas themed version of a Brazilian steak house, where you pay a set price, eat from a 30 item salad bar and a six item side table, and waiters bring a meat cart to your table with 8-9 cuts. There's also a Chilean and Argentinian wine cellar. The real star here is the building. This is an odd but magnificent building, an architectural display. It's worth one visit just for the building. As for the food, Cowboy's is pricey at $25 for the salad bar only and $40 for salad bar plus meat cart. It's an excellent salad bar. The meat cart includes chicken, pork and lamb but the various cuts of steak are obviously the main attraction. However, there are two problems with those cuts. First, they're all rare. There's no other setting : no medium, no well done, not even a medium rare. Second, they're not seasoned. At all. Management says this allows the customers to season them to their own taste. But a large percentage of customers want their steak seasoned back in the kitchen. There's another problem. For whatever reason, you have to make an advance reservation via Open Table, which has driven away many potential customers. 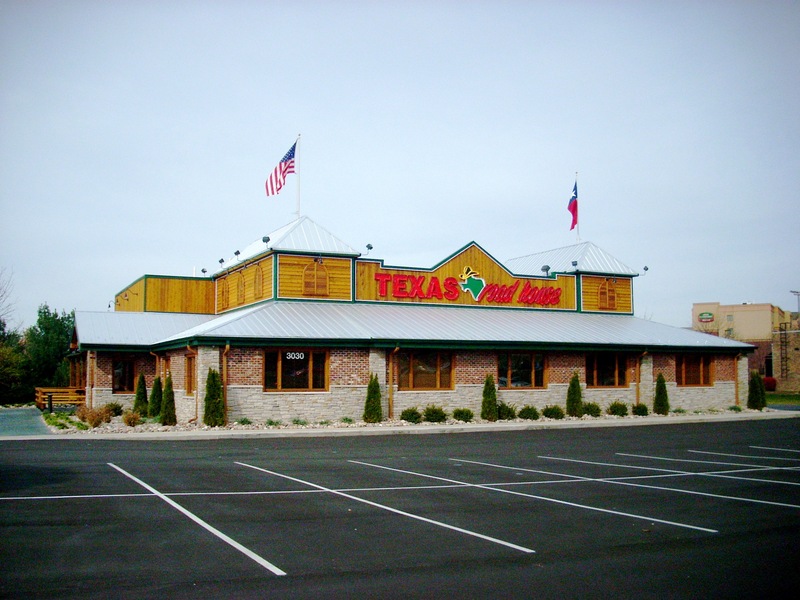 Logan's is a classic Texas roadhouse, featuring flame grilled steaks with other menu items for wives and children. Logan's revels in a redneck male atmosphere, so good old boys can get back to their roots here. 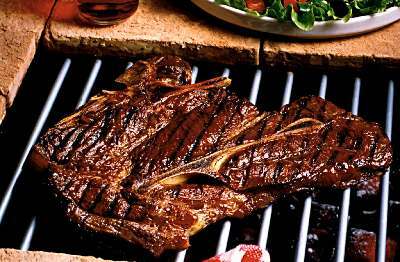 The steaks are USDA but are midwest corn fed, rather than high country grass fed or feedlot chemical fed. The house specialty is an 8 oz. sirloin laid atop a bed of Michelob braised onions and brushed with garlic butter. Then there's a straight 6 or 8 oz. sirloin, 8 oz. teriyaki club steak, 12 oz. New york Strip, 6 or 8 oz. Filet Mignon, 12 or 16 oz. Ribeye, 16 oz. T bone, 20 oz. Porterhouse, and 12 or 16 oz. Prime Rib. Fayette Mall and Hamburg Place. 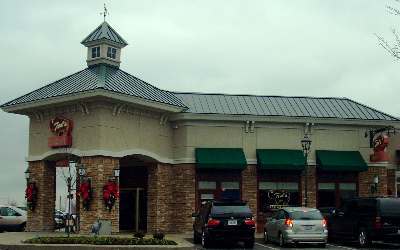 Malone's is a famous Lexington steakery which has opened additional outlets but still runs the empire from its Lansdowne headquarters, shown here. Malone's is proud of its inclusion in several national top 10 lists, which start with the Texas Land & Cattle Co. in San Antonio, include two or three other Texas restaurants, and fill the remaining slots with places from the largest cities. 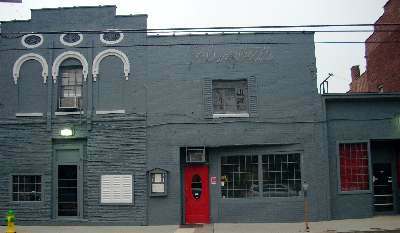 Lexington is the smallest city to have an entry. Malone's is unquestionably good at preparing and seasoning its steaks, but its secret is in the meat's high quality before it ever gets to Lexington. 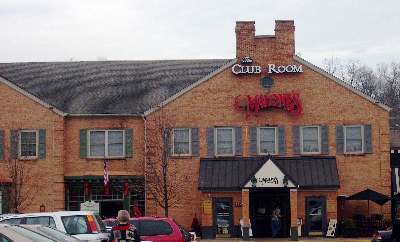 Malone's buys top grade USDA Prime and Wagyu Kobe Beef, which are expensive, and account for higher menu prices. They offer 11 cuts of Chicago Prime, two of Wagyu Kobe, six kinds of filet medallions, three steak-seafood combos and a lamb t-bone. The rest of the menu is excellent, too. The Soup of the Day is always good, and, while it may be overkill here, the Steak & Potato Soup would be delicious anywhere else. Sides and salads included with the steaks are excellent. Ted's Montana Grille is more than a steak house. It offers very good burgers, chicken, salmon, trout, and classic root beer floats. Its slow roasted bison pot roast and bison meatloaf are two of the finest items on any menu in town. And despite the outside appearance of the building, once inside, you're in a replica of an old Western saloon. Eating in the Montana Grill is a fine restaurant adventure. But the bottom line is : If you want a good steak at a reasonable price, this is the place to come. 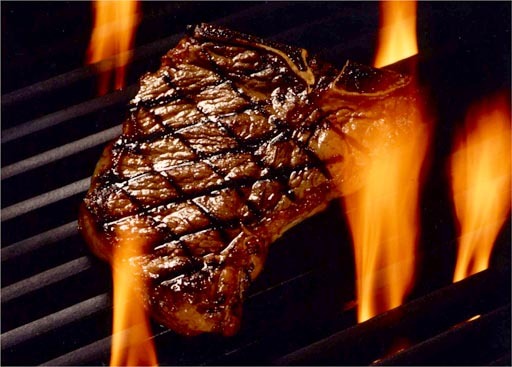 Their prime rib at 10, 12 or 16 oz., USDA choice tenderloin at 7 or 9 oz., and Harris Premium Kansas City 11 oz. Strip and Delmonico 14 oz. Ribeye are competitive with anything in town. But the real draw here is the Bison. You can walk into several rival steakhouses and match the regular steaks. But nobody else in town offers Bison steaks. Turner uses Great Range Brand, famous for grass raised, chemical free, open range, zero cholesterol bison. You can get it in a 9 oz. tenderloin filet, 11 oz. Kansas City Strip, or 14 oz. Delmonico Ribeye. 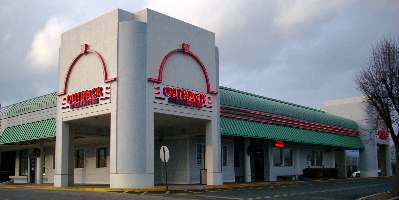 Outback is even more diverse than Montana Grill, but is still included because its steaks are so good. A Bloomin Onion is a must. They're cooked until golden, then served with dipping sauce. Several of the Soups of the Day are really unique. But the steaks are the show. They include a Slow Roasted Sirloin, 12 oz. 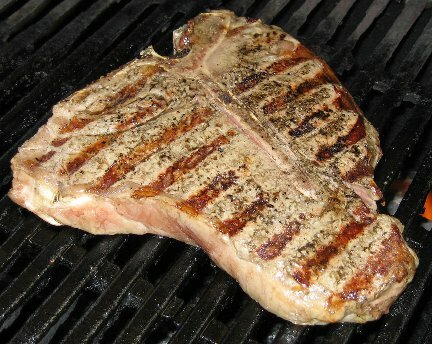 center cut Outback Special, 9 oz. Victoria Center Cut Filet, 8, 12 or 16 oz. Prime Rib, 14 oz. Ribeye, 12 oz. New york Strip, 20 oz. Melbourne Porterhouse, and Filet Medallions. Then there are Salmon, Crab Cakes, Rack of Lamb, Grilled Pork Chops, Lobster Tails, Alaskan King Crab, Baby Back Ribs, various burgers, and an obscene dessert called the Sydney Sunday. The Outback empire was founded by a UK graduate.